Louis Armstrong soars over the top of the music, on top of the melody. He stays on top, leading the band along toward crazy, wild, infectious joy. From the beginning song “St. 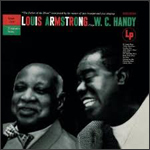 Louis Blues,” Louis Armstrong uses his distinctive horn playing and one-of-a-kind voice to lead his All Stars band, and you, on a journey through the most famous, seminal songs in the history of the blues. W. C. Handy, another band leader and horn player, is considered to be “The Father of the Blues.” Starting in the 1890s, Handy is credited with creating this new style of American music by incorporating the African-American folk traditions with the sounds of the music he heard in the churches and the fields of the South. In “Loveless Love,” first Louis plays the entire song’s melody with his trumpet, accompanied by his stunning band. Then Velma Middleton smoothly sings the first few verses. Finally Louis joins Velma, both of them singing in a cool jazz style that sounds as fresh and modern as anything you hear today. Louis and the band finish out the song and bring it home in fine style. Louis Armstrong’s voice is an instrument; he sings as if he is playing the trumpet. His voice goes the same places that his horn would go, dancing around the melody, teasing and taunting it while the band swings and sways through the melody’s path. And to say that Louis’ trumpet playing is great or outstanding or whatever other word you can come up with does not do it justice. I think that you can only describe it with the same phrase that was inscribed on Michael Jordan’s statue: “The best there ever was. The best there ever will be.” The high notes that Louis hits at the end of “Chantez les bas” are ear piercing, heaven reaching. I have read that other trumpet players have tried to reproduce Louis’ horn playing, but only ended up with split lips. Louis Armstrong was an outstanding band leader. He guided his band through a song’s melody … singing and playing above it, below it, and around it … but ensuring that they all ended up together, at the same place. Louis lived in America during a shameful period of “whites only” American history. While he was treated like royalty throughout Europe, he could not even be served at many restaurants and hotels throughout the American South. When he was on the road, spreading his beautiful music, he had to send his manager in to get food and he had to eat and sleep in his car. The fact that this type of disrespect and inhumanity did not break him and make him an angry, bitter man is further testament to his strong character and brilliant mind. All he ever did, and all he ever wanted to do, was to play music. It was all that mattered to him. It was important. While he smiled and joked on camera, he was very serious, dedicated, and passionate about his music. He was a genius who we were lucky to have shared this earth with. When I first heard of Louis Armstrong, as I was growing up in the 1960s, he seemed to be an elderly gentleman who appeared on variety shows with a trumpet and a white handkerchief, singing “Hello Dolly.” If that is all you know of Louis Armstrong, then you don’t know anything. The way that Louis Armstrong plays makes you want to stand up and scream. All of us who just play the accompanying instruments need someone like him to lead us, to pull us up, to make us realize how beautiful life can be, to appreciate the beauty of the human race, and to help us realize what we can be if we work together and just go crazy! Thank you Louis Armstrong. It is no wonder that this album made W.C. Handy cry.